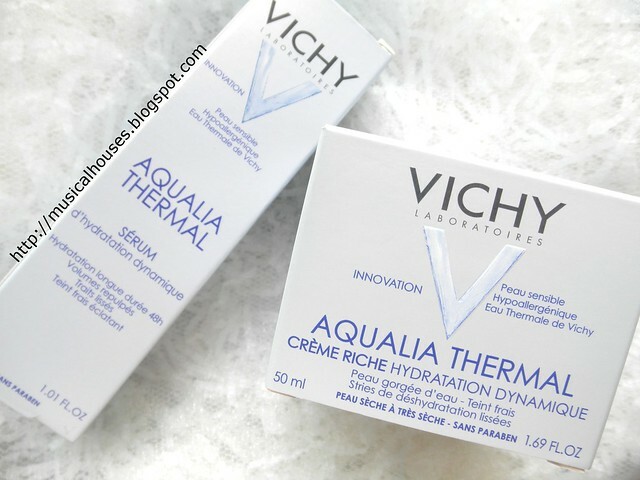 Vichy's latest range of Aqualia Thermal skincare products, has the tagline "Dynamic Hydration", and as you might guess, the range promises hydration for all skin types. There are a few products in the range, the key ones being the Aqualia Thermal Serum and the three types of Aqualia Thermal Creams, the Rich Cream (for drier skin types) and the Light Cream (for oilier skin types), and a Night Cream. There's also other products including a Lip Care, an Eye Cream, and a Day Care Lotion with UV Protection. So you know that within the Dynamic Hydration Aqualia Thermal range, there's something you're bound to like! The "Dynamid Hydration" product claims are quite interesting - the products give up to 48 hours of hydration but don't feel heavy or thick. I have for review, the Aqualia Thermal Dynamic Hydration Serum and Rich Cream. I thought I'd test both of them and review them for you - and of course knowing me, we start off right at the ingredients list! First, let's take a look at the Aqualia Thermal Serum. The ingredients list are below. 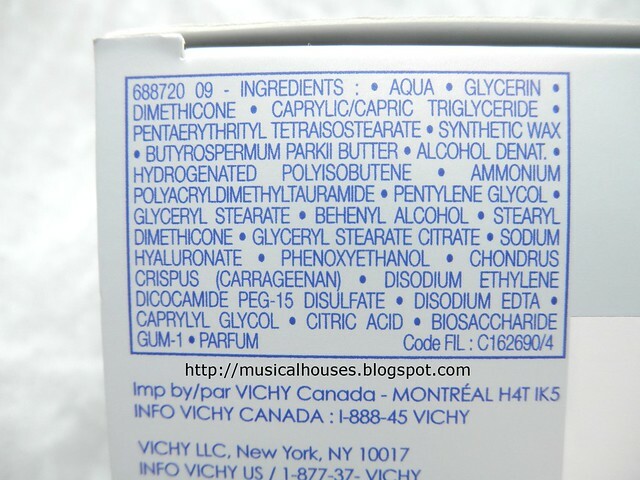 From the ingredients list, you can see that the product has the usual ingredients for a serum. The main ingredients are water, humectants (Glycerin, PEG/PPG/Polybutylene 8/5/3 Glycerin, Soduium Hyaluronate), and some silicones and polymers that function as slip agents and emollients (Dimethicone, Dimethiconol), and emulsifiers to make sure everything is nicely mixed together and not separated (PEG-60 Hydrogenated Castor Oil). So in a sense, because it has mostly humectants and emollients, it's not a particularly ground-breaking skincare product, and it's quite a simple one that has a basic function of hydration. Most of the same broad types of ingredients are also found in other products - humectants, emollients, emulsifiers, etc. But there are some interesting bits in the product that make it slightly different from its competitors on the market. 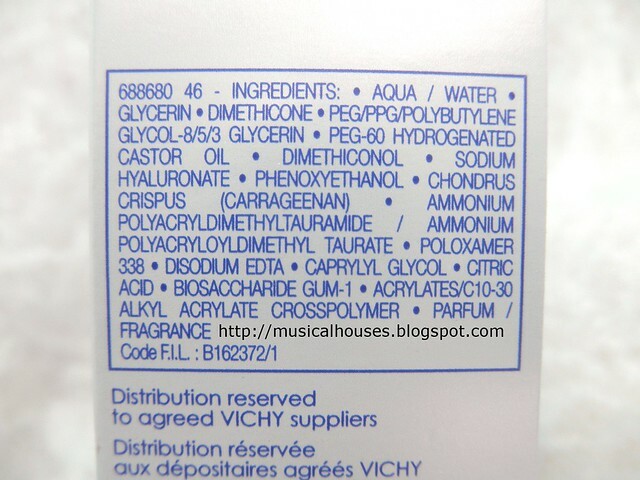 For example, PEG/PPG/Polybutylene 8/5/3 Glycerin is a humectant that also has emollient properties, and is found mainly in other L'Oreal Group products (you'll also find it in other umbrella brands such as Kiehl's, YSL, and Lancome - I'm guessing the reason for this is probably business-related, like a sole buyer contract that both companies must have entered into or something). So that's unique to L'Oreal Group products. Apparently according to Innovadex (a manufacturer of the ingredient), its moisturizing properties are boosted when combined with Glycerin. So you can expect good hydration from this product. My experience with the product was borne out by the ingredients list. I found this to be a very light-textured, gel-like serum, and not as sticky as some of the Japanese brand serums. It sank fast into my skin, and seemed to help my skin stay hydrated. Because it feels so light, it would be good for those in hot, warm climates (like Singapore right now! And all the time!). I was happy with it, but it might not satisfy those who are looking for something more. Vichy Aqualia Thermal Dynamic Hydration Serum: A light, thin-textured serum that still hydrates the skin. For that, enter the Aqualia Thermal Rich Cream. For those who are looking for Dynamic Hydration to a greater degree, I suppose! The ingredients list for the Aqualia Thermal Dynamic Hydration Rich Cream are below. There is water, Glycerin, Soduium Hyaluronate (the same humectants found in the Serum), and Dimethicone (a silicone with emollient properties, also found in the Serum), but the rest of the ingredients are mostly different. There's other emollients and skin conditioners (Capric/Caprylic Triglycerides, Butyrospermum Parkii (Shea Butter), Pentaerythrityl Tetraisostearate, which also can serve as an emulsifier, Synthetic Wax, which also can serve other functions such as to thicken or stabilize a formula, Hydrogenated Polyisobutene), and other necessary ingredients such as stabilizers (Ammonium Polyacrylate Dimethyl Tauramide), and emulsifiers (Glyceryl Stearate). So yes, while the bulk of the ingredients also serve to hydrate the skin like the Aqualia Thermal Serum, the Aqualia Thermal Rich Cream uses a greater number of emollients, and I daresay, with greater occlusive properties, which helps to prevent further water loss from the skin (known formally as trans-epidermal water loss, or TEWL if you ever read any literature on the topic). This will also account for its heavier feel on the skin. I can see some ingredients that will really appeal to those with dry skin too, like Capric/Caprylic Triglycerides and Butyrospermum Parkii (Shea Butter). My experience with the Aqualia Thermal Rich Cream, again, was also borne out by the product. It was a thicker, opaque white cream, and although it is heavier than the Serum for sure, I'd say that in the broader scale of skin creams, this isn't by far the thickest I've tried. One of the things I like about L'Oreal Group products is the way they formulate the products to feel light and aesthetically elegant on skin, even if it takes a bit more tweaking with the formula (except perhaps Kiehl's, which seems to prefer thicker formulas). So I would venture that although this is a "Rich Cream", there is nothing to stop someone with say, combination skin with dry patches, from using it. For me, I have combination skin of this sort, because although I have a history of acne and oily skin (as you will know if you've been reading my blog), I'm also starting to find that as I near my 30th birthday (still a few years away - don't congratulate me just yet! ), my skin is also starting to do that "get drier as it gets older" thing. So I've been experimenting with heavier creams, and much to my surprise I find that I'm starting to appreciate them. There is also a "Light Cream" version too, so I suppose for those who aren't yet thinking about their age, the Light version might work better for them. Vichy Aqualia Thermal Dynamic Hydration Serum and Rich Cream: Simply-formulataed to deliver hydration with minimal irritation. So with all that said and done, would I recommend the products? I'll be frank - if you're after hydration, these are good products, although the formulation is a little basic for both of them. But at least they delivers on their promises - it advertise themselves as hydrating, and indeed, the formulas of these products are hydrating. On the bright side, these are unlikely to break anyone out (unless the fragrance bothers you), because for the most part Vichy has stuck to using ingredients that are well-established to be quite non-irritating. Between the two, I personally prefer the Serum for its lighter texture that gels better with the hot weather and my combination skin, and the more unique use of PEG/PPG/Polybutylene 8/5/3 Glycerin and Glycerin combined, so that's a little extra which distinguishes the product. Also, the pump bottle the Serum comes in is, to me, much better than the jar form the Rich Cream is packaged in (I don't really like the idea of dipping my fingers into a jar). But for those who want stronger hydration, then the Rich Cream may work better. If you're looking for a solidly hydrating range, you can check out the Aqualia Thermal products. The Bottom Line: The Aqualia Thermal Serum and Rich Cream, although a tad basic, deliver on the the promises of hydration and aren't likely to break anyone out. Sometimes it's nice to just use a simple product that doesn't try to promise the world. Both of these products sound great and easily recommendable to anyone. I have heard about these products. Some are good and some are not. This made me curious about it so I guess I will give it a try. I hope I can get samples of it because I do not want to buy the whole bottle. I want to test it first and see how it will work on my skin. I really like your post & that you also mention the ingredients. It's more than just sayin this serum is nice and I like it.